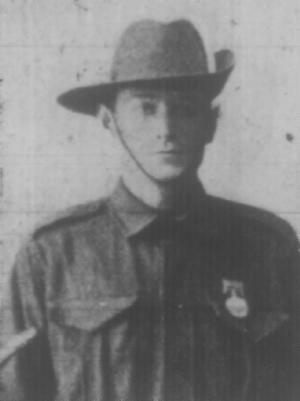 93 Corporal Harry Farguson was a 31 year old bridge rigger from Leichhardt, New South Wales, and declared he was a single man and a Boer War veteran originally with the 5th Victorian mounted rifles. The medal Harry is wearing in the photo above is most likely his Boer War Service medal. Harry and his younger brother Arthur were both born in Victoria , but were at one stage according to Victorian records, wards of the state. Harry was also a member or “Brother’ of the Australian Protestant Defence Association or APDA. An article in “The Watchman” a newspaper that championed the cause of the Australian Protestant Defence Association describes how their member Brother Harry was helping defend the Empire. “The monthly meeting of the Annandale Lodge was held in the Council Chambers on Thursday September 3. The W.M Bro. Colebook, presided and there was a good roll out of members. One’ candidate was initiated and another admitted by clearance. One candidate was unable to come owing to having joined the expeditionary forces. Three brothers of the lodge are going to the front, viz., Bros. Arthur Drives, Harry Farguson, and Robert Howe. It was decided that the members be kept clear on the books till they return. The W.M. complimented the brethren and said that he was proud to have members carrying out their obligations in a practical manner in defending our Empire in the time of need. He recommended our brethren put their trust in God, and if it was his wish, they would return amongst us. Harry Farguson’s story however takes a few unexpected turns.………. Harry was among the first to land on the morning of the 25th April at Gallipoli,… he was shot in the right arm completely shattering his right forearm. There were long delays in attending to the wounded on landing day and eight hours later Harry was eventually loaded on board a hospital ship and his arm was amputated that same night from the elbow down. He returned to Sydney, Australia at the end of November 1915 and was welcomed by his brethren of the Annandale APDA. Contrary to his attestation as a single man and listing a sister as his next of kin, Harry was in fact married………..
Harry was married to Alice Ellen Louisa Mills in 1909 and together they had a son born in 1910 – Allan Gordon Farguson. His wife Alice and young son Allan were both living in Victoria when Alice forwarded the following letter to Defence Base Records. The following is the transcript of the letter from Harry’s wife Alice. 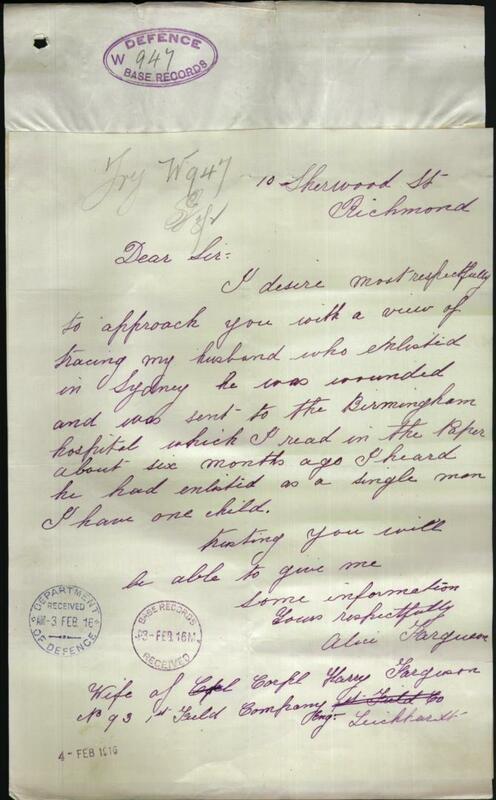 I desire most respectfully to approach you with a view of tracing my husband who enlisted in Sydney, he was wounded and was sent to the Birmingham hospital which I read in the paper about six months ago. I heard he had enlisted as a single man. I have one child. Alice had written this letter to the Base Records Department in February 1916 and Harry had returned to Sydney four months prior, but had made no effort to make contact with his wife and child. The Base Records Department advised Alice of his circumstances and with a sympathetic view took the unusual step of advising Alice the details of Harry’s next- of- kin, presumably his sister living in Sydney. The unfortunate twist to this story was that Base records sent this reply to Richmond NSW instead of Richmond Victoria. A postal error meant Alice may have never received the letter or the information she was seeking. After returning Harry followed up his repatriation and received his war pension and lived out most of his life as a messenger in Coogee, NSW where he died in 1942 aged 60. His wife Alice never remarried and died in Victoria in 1974 aged 95, their son Allan Gordon Farguson died in 1966.